The winners of day 3: From left: 1st runner-up Gihan Pushpakumara of Team Sri Lanka Army, The winner Avishka Madonza of Team Sri Lanka Ports Authority and 2nd runner-up Prabath Madusanka of Team Sri Lanka Navy. The Day 3 - SLT SpeedUp Cycle Sawariya started from Balangoda to Mahiyanganaya yesterday morning. The cyclists traveled through Haputale, Bandarawela, Badulla, Meegahakiwula, Loggal Oya to reach Mahiyanganaya covering a distance of 161 Km. The contestants reached Mahiyanganaya just before 12.45 pm on the third day. Avishka Madonza of Team Sri Lanka Ports Authority completed the race at first on the third day while Gihan Pushpakumara of SL Army came in second. Prabath Madusanka of SL Navy became third. 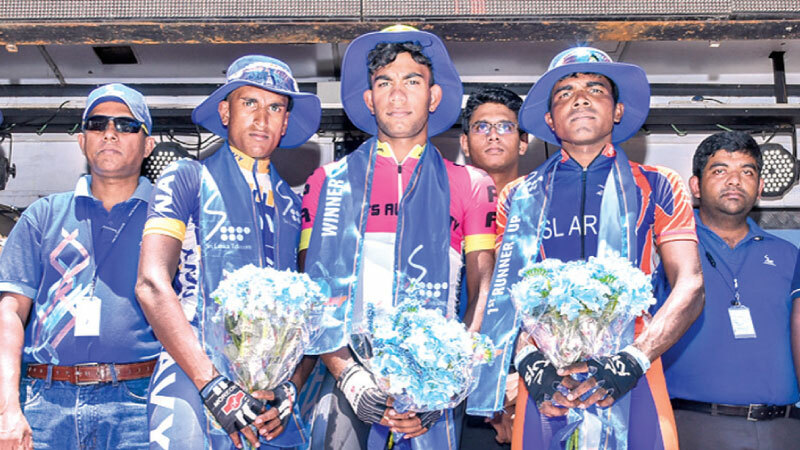 The third edition of ‘SLT Speed Up Cycle Sawariya’, the longest cross country cycle race organized by Sri Lanka Telecom under the inspection of Cycle Federation of Sri Lanka (CFSL) commenced at the Galle Face Green. The Men’s race will also marked as the first race running through the famous 18-bend route after a lapse of 15 years. The winner of the five-day event will receive a cash prize of Rs. one million.